Introduction to Chinese Herbs — Amy Chitwood Burslem, LAc. When people think about Oriental Medicine, acupuncture often comes to mind first. Yes, practitioners in the United States typically focus on using acupuncture. However, Oriental Medicine contains five branches: acupuncture, herbs, nutrition, qi gong and massage. In China, herbs may be the most widely used. Hospital patients in China routinely receive herbs as part of their medical treatment, and many Chinese intentionally use herbs in cooking to provide medical benefits. Within the university setting, herbalists spend five years or more studying before they can treat patients. The list of Chinese herbs, known as the Materia Medica, includes over 400 substances, including not only plants but also minerals and animals products. If you are interested, check out The Chinese Herb Academy (http://chineseherbacademy.org/databases/databases.html) for a database of herb information. Herbalists have used these substances for thousands of years, refining the list to include the herbs that most effectively treat a wide range of conditions. Scientific studies have looked at some of these substances, although much of the pharmaceutical research goes into isolating single compounds that can get patented. Many of these herbal substances have complex effects, making them challenging to isolate and study from a biomedical perspective. So how do herbs differ from pharmaceutical drugs? Most pharmaceutical drugs contain a single active ingredient that targets a specific physiological process. Since they target a single process, dosage is often used at a relatively high level so it will significantly alter that process. They can achieve dramatic results but can also cause significant side effects. Chinese herbs contain multiple active ingredients, sometimes in the hundreds, but at a much lower dosage level. Because of this, they can affect a range of processes in a much milder way. One master herbalist said comparing pharmaceuticals to herb is like comparing jet fighters to bicycles. 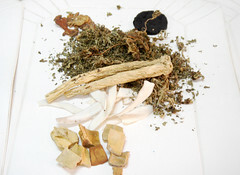 Nevertheless, Chinese herbs can have a huge impact. At our school, we have seen a range of difficult conditions, from thyroid problems to skin disorders, brought under control. So when you think of Oriental Medicine, remember that the Chinese have used herbs as a safe and effective treatment for thousands of years.